At Omori Diamonds we specialize in crafting fine engagement rings, wedding bands and custom jewellery in Winnipeg, Manitoba. We work directly with you to help plan the perfect custom design made just for you or your loved one. In todays’s blog we will be talking about the April birthstone, diamonds! Read on to learn more about the legends and stories surrounding this most beautiful of precious gem! Well with spring finally here, today we thought it would be appropriate to discuss April’s birthstone, diamonds. As one of our most popular precious gemstones, diamonds possess some very special qualities that make them not only incredibly brilliant but also everlasting in their strength and durability. Aside from being Aprils birthstone, diamonds are the the earth’s hardest substance and are formed over billions of years when carbon atoms are exposed to enormous heat and pressure within the earth’s crust. The whole process involved in forming a diamond, takes between 1- 3.3 billion years which is about 25%-75% of the age of the earth itself! Due to their hardness ( Diamond score a solid 10 on the Mohs scale of hardness), diamonds wear very well over time and can be passed down for many generations, hence the catchphrase “a diamond is forever“. For this reason they are the perfect choice for an engagement ring as well as wedding rings or any piece of jewellery that you wish to wear for years to come. Diamonds have also been appreciated by many cultures for centuries. From India to Ancient Rome, many legends have been told to explain the wonderful beauty of this precious gem. As the hardest substance, it was often believed that wearing a diamond would give the wearer superhuman strength. The Ancient Romans even believed that the Cupid’s arrows were tipped with diamonds, a tale which fits perfectly with the diamonds reputation as a symbol of love. It seems that more than any other stone or gem, diamonds have been seen in an almost magical light within pop culture for centuries even making their way into pop music with songs such as Marilyn Monroe’s Diamonds are a girl’s best friend and Rihanna’s Diamonds. Of all the different amazing traits of this beautiful stone, perhaps the most fascinating is the diamonds sparkle. When expertly cut, diamonds are able to display incredible brilliance, even showing bright flashes of the colours of the rainbow, known as scintillation. Although you have probably heard about the 4 C’s (colour, clarity, carat, cut) the true beauty of a diamond is really brought out when the diamond has been cut masterfully as this involves an expert diamond cutter shaping and polishing the stone so that it can properly return the maximum amount of light back out the top, creating brilliant flashes of white light and colour. Here at Omori Diamonds, we take special care to insure that we source the absolute highest quality cut diamond for each client as this will insure that they receive a very bright stone that they will be proud to wear. To learn more about the technical aspects behind choosing the perfect diamonds, please visit our diamond education page as well as the GIA website which is loaded with tons of great diamond related information. 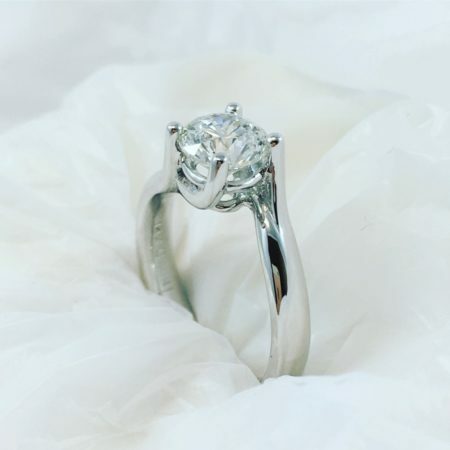 As Winnipeg’s premier custom engagement ring designer, we have had the pleasure of helping hundreds of couples create their perfect diamond ring. Let’s take an opportunity to have a look at some of our favourite engagement rings and custom rings which feature Aprils birthstone! 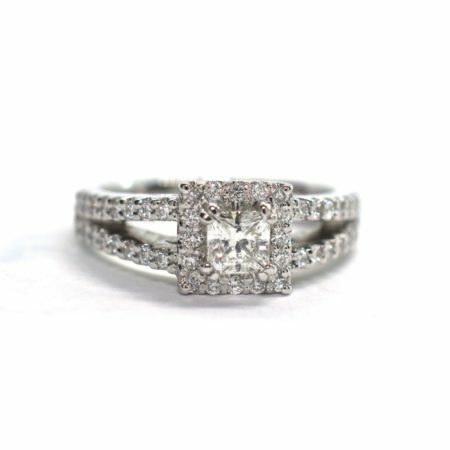 This wonderful engagement ring features a brilliant princess cut diamond set in a split band, side stone design. The is a perfect design for those who love the modern look of halo engagement rings with the eye catching sparkle of square cut, princess cut diamonds. 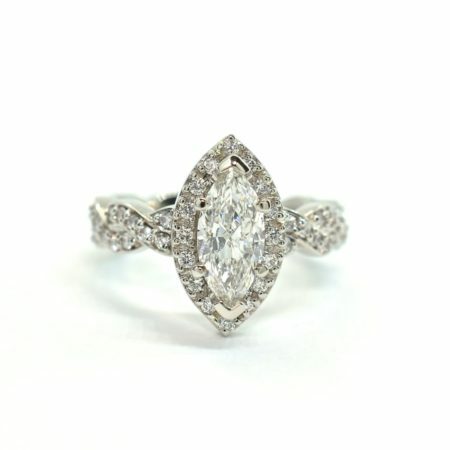 This spectacular custom engagement ring features an absolutely brilliant marquise cut diamond. Another unique feature of this design is the winding infinity band which is lined with beautiful diamonds creating a band of sparkle around the finger. 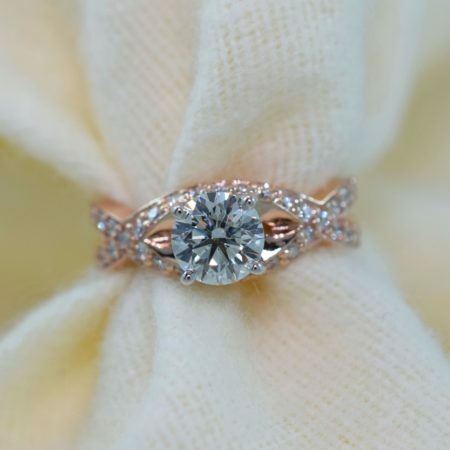 This special rose gold engagement ring has been one of our most popular rings on instagram. In this photo you can really see the elegant infinity pattern created by the criss crossing of the band. Rose gold has been a favourite among many of our clients due to its soft and warm tone. 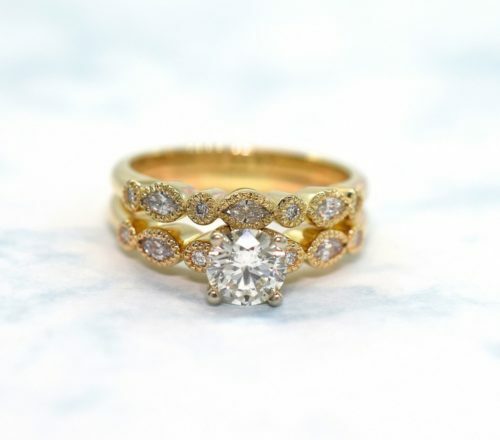 As you have probably noticed, vintage engagement rings are one of our most popular styles of diamond rings that we create. It seem many couples love the timeless look of the detailed millwork and engraving of vintage styling. This design features the winning combination of both round and marquise cut diamonds creating a truly royal looking design. Thanks very much for checking out this article on the April birthstone, diamonds! We hope you have enjoyed learning about this precious and wonderful gemstone and been inspired by our designs. Feel free to get in touch when the time comes to create your very own diamond ring for yourself or someone special. In the mean time don’t forget to keep in touch by following us on facebook, twitter or instagram!